Seeing the Dutch saying below, and reading an article by Tom Philpott, caused me to consider how farmers make decisions on fertiliser applications. Philpott argues that use of synthetic nitrogen fertiliser causes loss of organic matter in the soil, contrary to some popularly held beliefs. The article goes into comprehensive detail, citing recent research done in the United States of America, showing how using large amount of fertiliser negatively effects soil biology, soil structure and the soils ability to store nitrogen, which are all linked to loss of organic matter. The argument advocating for large amounts of chemical nitrogen fertiliser which I have most often heard is about pasture growth. Farmers have told me that they can only get enough pasture growth, which is necessary to support milk production for the farm to remain profitable, through applying large amounts of chemical nitrogen fertiliser. That is very short term thinking though because it is not sustainable. 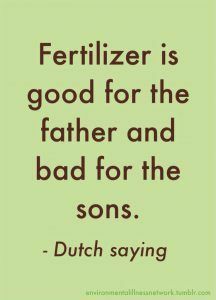 The Dutch saying is striking, especially when you consider the desire of most farmers I have encountered to leave their soil in a healthier condition for future generations. I would go even further though, and say that the negative effect of excessive nitrogen fertiliser can be reversed in as short a time as five years if the correct practices are adopted. The immediate growth that is obtained by putting down large amounts of nitrogen fertiliser is not worth the longer term negative effects that it has on soil health. Two of the prominent aspects of sustainability are long-term profitability and environmental protection. Limiting chemical nitrogen fertiliser use to only what is very necessary contributes to both of these aspects. It is not necessary to lose out on pasture growth by decreasing chemical nitrogen use, but this is only true if the health of the soil is restored. This is so that the natural processes of nitrogen mineralisation and nutrient cycling are functioning to support growth. I am not an advocate for absolutely zero use of chemical nitrogen fertiliser, but the extent to which chemical fertilisers can contribute to profitable and effective pasture production, while at the same time benefitting soil quality and health, is influenced by the implementation of good farm management practices. Commercial farms are highly productive and intensive agricultural systems which often require greater nutrient inputs than what would constitute as natural, but the natural system can still function to support this high production. Each paddock should not be seen as an isolated system which has certain requirements, but rather the whole farm seen as a holistic agroecosystem which has natural processes that function to cycle nutrients and support production. This is especially true in a healthy agroecosystem. I advocate for this to be considered when deciding how much fertiliser to use on farms, so that healthy agroecosystems can be restored for long-term production benefits. Future generations will thank us. Further proof of the positive effect of decreased nitrogen fertiliser What is the SWAN system?